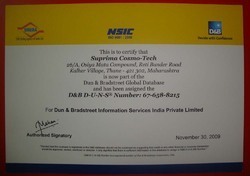 Since our commencement is in year 2001, we, “Suprima Cosmo-Tech” is an ISO 9001:2008 certified company prominently engaged in manufacturing, supplying and exporting a comprehensive range of Personal & Baby Care Products. These products are skin friendly, free from chemicals, removes excess serum & dirt, maintain the softness of the skin, source of rich vitamins, optimum quality and highly effective. These products are formulated by knowing the tenderness of the skin for babies as well as for elders. 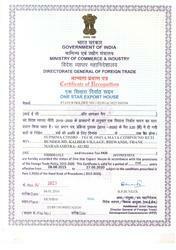 Based in Mumbai (Maharashtra), India since inception, ours is a Sole Proprietorship (Individual) firm. All our products are formulated knowing the tenderness of the skin and can be used for babies as well as for elders. We are backed with sophisticated infrastructure facilities, which is well equipped with latest standardized machinery and technologies. All these equipment is used to formulate our entire range by our diligent team of expert professionals. In order to provide our clients with qualitative range of products, we use natural herbs such as pure milk extract, coconut oil, wheat germ and olive oil as key ingredients to process our range which are of high quality and also ensure their work as natural cleanser and skin toner. These products are creme based, known for their rich source of natural vitamin E and excellent skin softener. Owing to their various distinctive features these products are appreciated all over the world. In addition to this, our company is FDA approved and has received a membership from SSI to process the entire range. With the able guidance of our mentor 'Mr. 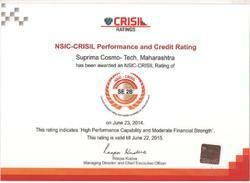 Sameer Vyavahare', we have gained a formidable position in the market. He hold in-depth knowledge and immense experience in this domain which help us in winning the hearts of many of our clients. 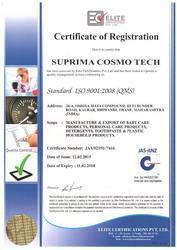 Suprima Cosmo-Tech is an ISO 9001:2008 certified; FDA approved leading manufacturer and exporter of various baby care and personal cosmetic products. With an experience of over 20 years, our proprietor Mr. Sameer Vyavahare has immense experience and wide knowledge in the related field. Our products are manufactured under his supervision and able guidance. We have received membership from SSI and have a well equipped manufacturing unit for producing these cosmetic products according to the needs and requirements of the buyers. Our experts are highly educated and have complete process knowledge. They know the combination of various essential substances in the required measurements to prepare the formulations. Knowing the tenderness of skin, we have developed our products for babies as well as elderly people. Team is an asset for any organization and we are blessed with the same. We have appointed a team of diligent and dexterous professionals in our organization, who are appointed through strict process. These expert professionals are well qualified and hold a vast experience and knowledge of skin and hair care about the babies and elders. In order to increase the productivity and minimize the wastage, our professionals utilize maximum amount of resources and work in close coordination among each other. Besides, we believe in harmony, so we are supported by a squad who works with dedication to understand the needs of our clients.